I found those Pepperidge Farm fish shaped sandwich thins again on sale - $1.50 for a package of 8. 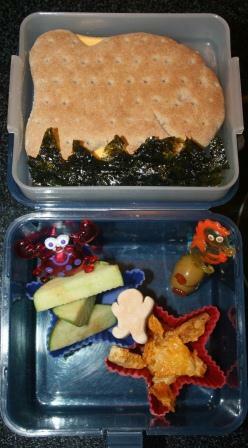 I grabbed them up and incorporated them into an ocean themed bento lunch for Pierce. He had a cheese sandwich with mustard nestled in roasted seaweed from Trader Joe's - cut with kitchen scissors to look even more like seaweed! Pierce loves the seaweed too, although I think I've eaten too much and now I'm a little over it. Apples on a crab skewer, olives on a seahorse skewer, and a star full of mango crunchies rounded out the bento. Oh wait, what about that little guy in the middle? Oh yes, that's dessert! A little marshmallow gingerbread man, riding the ocean waves. The fish theme is so cute. It makes me long for summer. Very cute... and seaweed is very alkalizing so it is something I can eat. Another fantastic lunch. I bet Pierce gets excited when he sees what you've come up with, mommy. My morning is crazy today, but there was no way I was going to miss Muffin Tin Monday!! Terrific, as always! Oh my gosh, the cuteness! i'm just laughing. so much for the 'momma says don't play with your food!' momma IS playing with the food! This might be my favorite of all time! Too cute! Your boys eat well.I thought of you at a second hand store with 3 different heart muffin pans on display. On a cuteness scale from one to ten, Lisa, this lunch is off the chart!! Will you adopt me and my kids? That's all. Your kids get such healthy cute meals on Monday! So cute! Love the marshmallow gingerbread man riding the waves! Such a cute idea. My kiddos would love it so guess I need to get my act together and do it! This is just too adorable!!!! You must be the best mom ever, and you are so creative! Seaweed? Umm, no thanks -- but you and Pierce go on with your healthy selves. Lol. You serve such cute and tasty looking meals! Love it, Lisa... What a creative and neat sounding lunch... I'm sure that Pierce really enjoyed it... Great Muffin Tin Monday. Awesome idea. I wish I could eat seafood and fish. I am allergic sadly. It looks good though. LOVE this!! That goldfish bread is awesome! Do these ideas come to you in your sleep? Always a new and fun theme. So cute Lisa! I bought those cute fishy bread for my kids and I was shocked they didn't like it! lol I love the variety of foods that you give pierce. How fun! You have happy food! Love your creative lunch ideas! I just picked up some star-shaped rice molds for my son. What a cute theme! I love the fish crackers with seaweed, I would have never thought about putting those together! That is super cute! I've always wanted to try that goldfish bread. I want to be healthy and stick around for grandkids - to enjoy them and be of service to my kids some day. I enjoy the feeling of accomplishment I get from working out! You inspire me Lisa. Also I've never seen those Pepperidge Farm thins around here before. I will have to look. Maybe Deaglan will eat them!